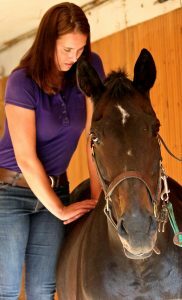 Animal Chiropractic is a natural, hands-on approach to your animal’s health care. Animal chiropractic focuses on the relationship of the spine and nervous system to the overall proper functioning and well being of an animal. This therapy is not limited to an injured or sick pet. Healthy and athletic animals are ideal candidates for chiropractic examination and care. Maintaining proper structural alignment permits optimal function of the muscles, nerves, and tissues supporting the joints, resulting in improved movement, stance and flexibility. The application of animal chiropractic involves a small quick thrust (adjustment) directed to specific joints of the spine and/or limbs. The adjustment helps to improve joint range of motion and mobility and helps restore proper function of the nervous system. The benefits seen are diminished pain, improved muscle tone, improved flexibility, and the breakdown of joint adhesions. Initial consultation and examination includes thorough health history review, gait analysis, static and motion palpation of the joints, muscles and extremities, range of motion testing, neurological evaluation, and sometimes a referral for x-ray examination or further testing to rule out a more serious problem. Chiropractic care is NOT intended to replace traditional veterinary care, but is considered a specialized complementary therapy for animals to be used concurrently and in conjunction with your Veterinarian’s care. Dr. Varik is a certified Animal Chiropractic servicing Southern Ontario, from Guelph to Belleville, Niagara to Barrie. Feel free to give us a call if you are not in the area, as special trips can be arranged.